When and why did you first become interested in gymnastics? Wayne Grant who owned an all star cheerleadimg program that I was in suggested that I give gymnastics a try. He thought I was too talented for cheerleading. Do you have any good/funny memories from when you first started taking gymnastics classes? I had absolutely no idea what I was doing when I started.. I went from a rec class to team in 2 weeks and had 2 months to prepare for season. I didn’t even know what I was getting deductions for or what they were. I just learned the routines and went out there and competed them. When did you decide you wanted to compete? And, when did you want to compete at a high level? I knew I wanted to compete when I was at an all star cheer competition and on the other side of the venue the Gaspirilla Classic was going on. I asked my mom if we could stay and watch and I was amazed at what the girls were doing. I knew at that moment I wanted to be a gymnast. What is your training regimen? I train 16 hours a week. How have you grown as a gymnast during your career, both skill wise and mentally? In the beginning of my career I was a dare devil, I would just see it and do it. Now I think my skills through. I now know they have to be performed correctly and precisely to get the best score. Mentally I’ve learned to just remain calm and focus and most of all have fun. How has gymnastics helped you as a person? It has helped me to become more disciplined. What are your biggest accomplishments or best memories in your career? Commiting to Auburn University, winning eastern nationals, making JO national team, qualifying to the Nastia Cup, but most of all the friendships that I have formed. What grade are you in school? I’m a senior. Do you want to compete in collegiate gymnastics? Yes, I will be competing for Auburn University. War Eagle!! What are your goals for the future, both as an athlete and after you are finished competing? For my immediate future is to just enjoy my last JO season and do well. And then to be the best college gymnast I can be, and hopefully help my team to the super six and help them win nationals. When you’re not in the gym, how do you enjoy spending your time? Do you have any hobbies or favorite activities? Charities? I love to sing and dance, go shopping and spend time at the beach with my friends. 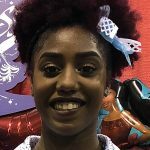 I’m involved with a group called youth united for success at my church, and im also a 2018 ambassador for brown girls do gymnastics.